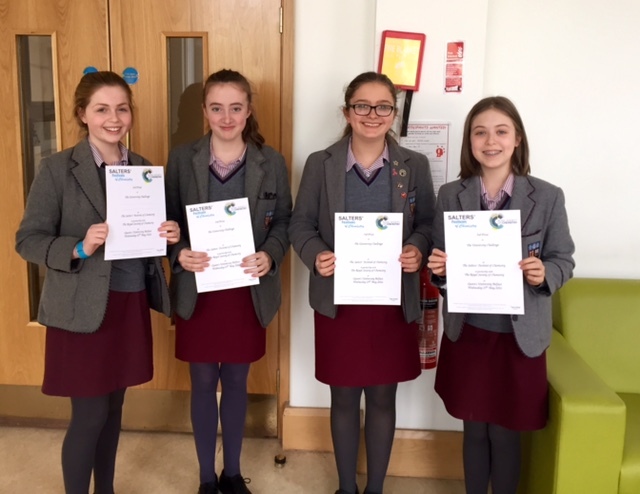 Congratulations to the school's Year 9 Chemistry team who were awarded third place in the Salters University Chemistry Challenge, hosted at Queen's University Belfast on Wednesday 25th May. The team is comprised of four Year 9 pupils, Georgina Lobo, Rachel Lyster, Victoria Jones and Kerri Fry. The girls have a keen interest in Science and were selected through their involvement in Junior Science Club. The girls had to complete two practical tasks in QUB's School of Chemistry laboratories. They were observed by chemists throughout the day, who then graded them on their scientific knowledge, experimental technique and ability to work as a team. The girls were competing against 14 other schools from Northern Ireland, this is a fantastic achievement. Well done girls! Posted on May 27, 2016 by Victoria College and filed under Success.